The Cone Nebula is located in the constellation of Monoceros at RA 6hr 41m 6s and DEC +9d 52m, and is about 2,600 light years distant. The cone-shaped, dark structure arises from cold molecular hydrogen and dust sculpted from stellar wind coming from the bright, very young star cluster, NGC2264, the Christmas Tree Cluster. Some of the faint emission around the dark column of the Cone Nebula is due to excitation from S. Monocerotis in the Cluster. 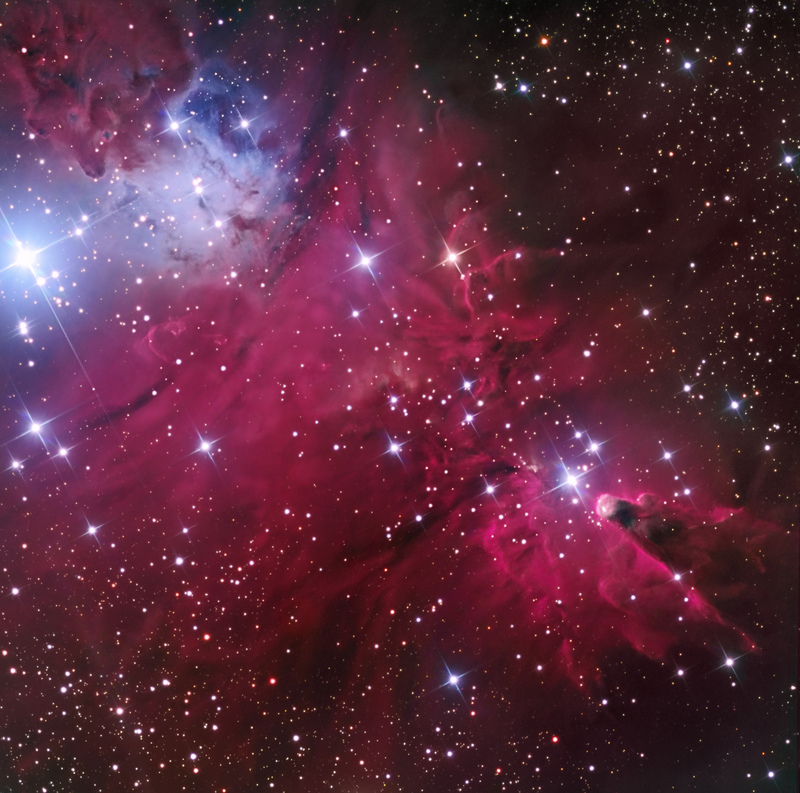 The Cone Nebula is about 7 light years long. There is a bright emission/reflection region grading into a blue reflection region near tne bright star. The darker object protuding down into the reflection region is the Fox Fur Nebula, named by David Malin. North is toward the left and the image is ~ 36′ x 36′. The system was guided with an SBIG ST-402 camera on an Astrodon MonsterMOAG off-axis guider. Astrodon Generation 2 LRGB and 3 nm H-a 50mm square filters were used in the Apogee filter wheel. Data were collected automatically with CCDAutoPilot4 using MaximDL4.62 and PinPointPro for plate solving. Data were calibrated and pre-processed in CCDStack. Final processing was done in Photoshop CS3.